Well equipped, well located apartment. Tracey was very helpful. Couldn't fault this place. Very clean, well maintained apartments. Fully equipped. Quiet location. Great pool and children's play area. Perfect for families. Bus service is excellent. Would highly recommend. We loved our stay in guernsey and in Albany self catering apartments! The apartment was very clean, the staff very helpfull! Wd'd love to come back!! Our list of European holiday apartments and self catering accommodation are suitable for all family budgets from cheap to luxury. So if you are planning your family holiday and are looking for a well equipped, family friendly holiday apartment in Europe then we are sure you will get some holiday ideas from our selection of holiday properties listed below. Our list includes properties near city and cultural centres, tourist attractions and popular holiday resorts with great beaches. Some of the self catering holiday apartments in Europe have "early booking" and "free night" offers. 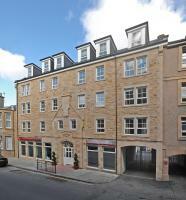 SACO Jersey Merlin House self catering apartments are in St Helier town centre close to the marina waterfront. Small supermarket just 50 metres away. Ideal for family holidays as there is plenty of space for children unlike in a hotel room. No onsite parking, park nearby on the street or at a public multi-storey car park. Located on the Isle of Man, in Douglas's Marina, Waterfront Apartments feature self-catering accommodation with free Wi-Fi available throughout. The property is close to the bay and just 0.7 miles away from the Isle of Man Government. City Apartments Glasgow is a modern apartment block centrally located next to the King's Theatre, within 800 metres of the shops of Sauchiehall Street. Contemporary design apartments feature light décor and sleek modern furnishings with wood floors. All have one or two bedrooms with separate living areas and fully equipped kitchen areas. The So Quartier is located in London, England, 3.5 kilometres from Hyde Park and four kilometres from the shops at Oxford Street. London Zoo is situated 2.5 kilometres from the hotel. Hotel Features. So Quartier has massage facilities and can offer beauty treatments. The front desk is open 24 hours a day and the multilingual staff can arrange airport transport (surcharge) and offer tour assistance. The Fountain Court Apartments, Edinburgh is a block of modern apartments situated in historic Edinburgh, half a mile from the shops of Princes Street and 1.5 miles from Edinburgh Castle in the city's vibrant West End. The 27 apartments are spread over five floors and feature simple contemporary decor with light wood furnishings. Ta' Rena Holiday Apartment Sliema is located in a quiet road in the centre of Sliema, and offers self catering apartments with free Wi-Fi. Free public parking is available nearby. 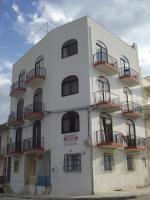 Gozo's Sunset Seaview Apartments are just 50 metres from the beach of Xwejni Bay. Each apartment offers a private balcony/terrace with views of the Roman salt pans and the sea. There is free parking in the area. ANTIQUE & ART LOVES dream location. Visitors to art fairs, Chelsea Flower Show and Portabella Road Market, Hyde Park and Kensington Gardens. will find our 2 bedroom modern serviced apartment is nestled amongst some of finest establishments. This apartment is situated in a modern block, nestled amongst the Georgian facades. Bayswater is popular with Art lovers and antique collectors. Oval apartment popular with families, couples and friends. 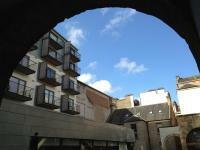 This well located cosy apartment near to Oval tube station. This apartment is near to Kings College Hospital, William Booth College, Ruskin Park, The Oval Cricket ground. This self catering apartment has a fully quipped kitchen, bathroom, living room and bedroom and is good value for money. The Harbour Apartments are located in Edinburgh, Scotland, 200 metres away from Royal Yacht Britannia. Waverley train station is 3.5 kilometres away, and Calton Hill is 3.5 kilometres from the hotel. Hotel Features. Public areas are decorated in a nautical style featuring blue, red, and white tones. Facilities include a reception desk with multilingual staff, wireless Internet access in public areas, and room service. TTG - has a new look! Copyright ©2006-2019 Hotels Online International Ltd. All rights reserved.